For 37 years, I have been traveling to this part of the world. How things have changed! In the early Eighties, Japan was fully in bloom as a major hub of classical music, with composers and performers from all around the globe. 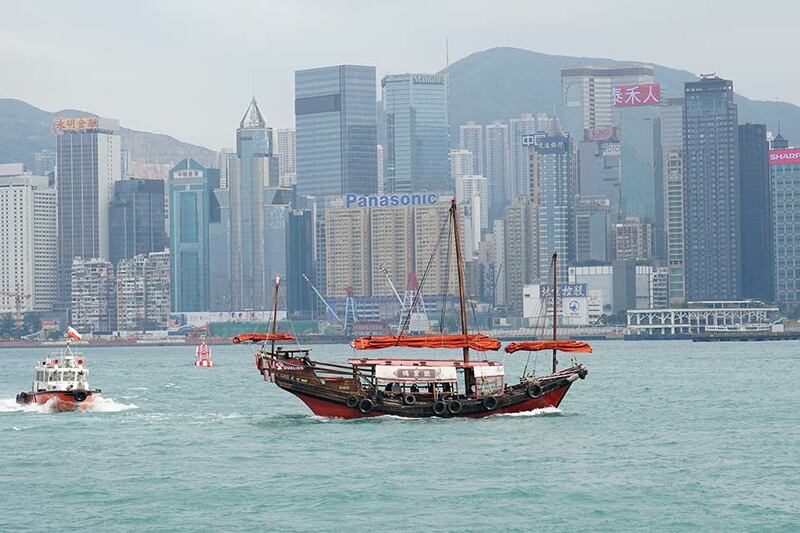 Because of its status as a British colony, Hong Kong enjoyed the benefits of both Eastern and Western traditions. China was still beginning its adventure, not only culturally but economically, understanding that in order to be a force on the global stage, embracing the artistic side of their counterparts around the world would become critical to opening up partnerships all over. This time, my trip started in Guangzhou, the third-largest city in China. My single experience with this city was on my first tour with the ONL. It is only an hour-or-so drive from Hong Kong, so the influence of that diverse culture can be found in the orchestra. Musicians from China as well as other parts of the world make up this ensemble. After a 13-hour flight from Los Angeles and a couple days to recover, we started rehearsing. For each of the Chinese orchestras, I had selected two pieces that would appear on all of the programs. This is something that is highly unusual for me, but I thought it would be interesting to compare how each group was either similar to or different from the other. One of my party pieces, the Second Rachmaninov Symphony, has always proven a litmus test for any orchestra. It is long (about an hour), technically demanding (especially for the strings), and a piece that requires a kind of flexibility that shows how free an orchestra can be. The Guangzhou Philharmonic had clearly come prepared. They went through the first reading with flair, each musician seeming to know his or her part well. Rehearsals were held in a facility away from the hall, but not too bad acoustically. By now most of you know that I value the sound of an orchestra above all when working with a group. That sound usually comes about as a result of rehearsing and performing in the same building as often as possible. We are lucky that this is generally the case in the States. 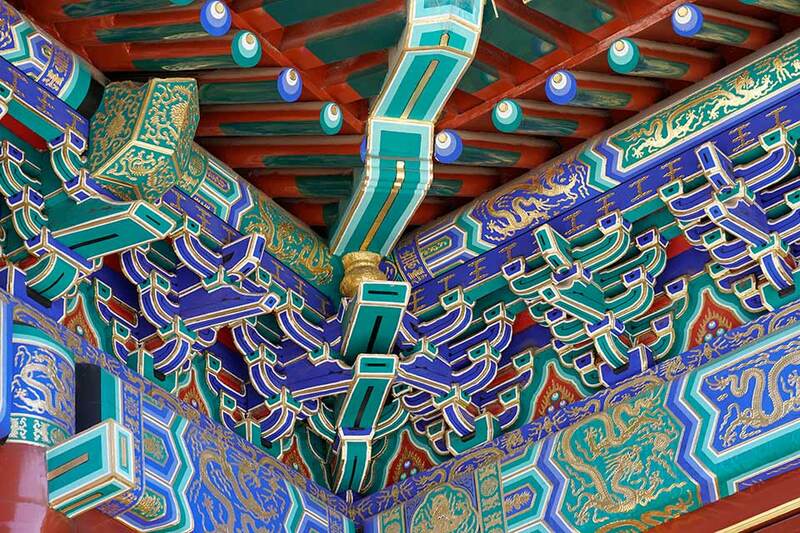 In Europe and Asia, the halls are occupied year-round and shared with other ensembles. This means that one does not have the opportunity to judge balances or reverberation time until the dress rehearsal. It was almost impossible to figure out what the collective sound of the orchestra really was like until the day of the concert. However, it was clear that in Guangzhou, the musicians had felt a responsibility to be as cohesive as possible. There were very few problems in intonation, and despite the technical demands, the strings were very much up to the challenge. The opening work, Bach’s “Little” Fugue, turned out not to be the version I thought we would perform. As was common practice in the first half of the 20th century, and well before, many of the German master’s compositions for organ were transcribed for orchestra. Ever since my high school days, the one I was used to was by Lucien Cailliet, the orchestrator in Philadelphia. 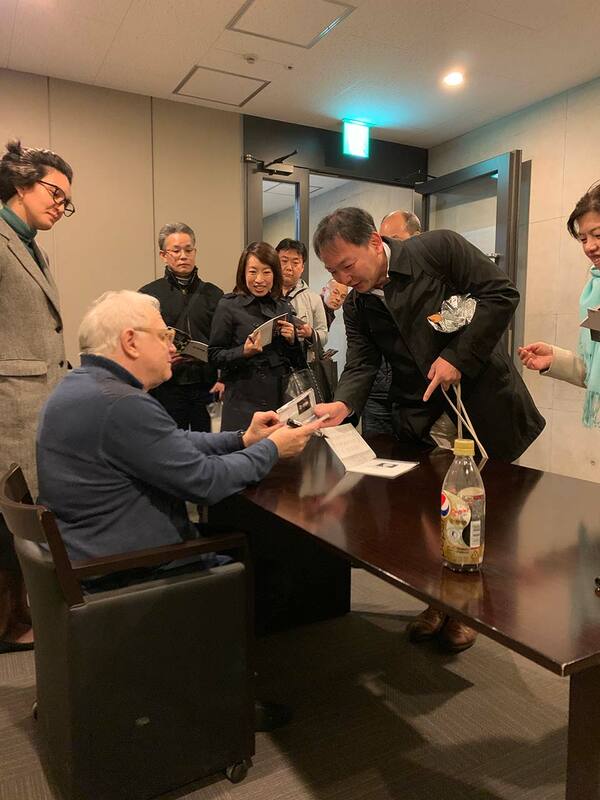 When I arrived for the first rehearsal in Guangzhou, as would be the case in the other two cities, it was the Stokowski edition that was on the musicians’ desks. Among the reasons that I believed the Cailliet would work is that the orchestration is about the same as for the Rachmaninov symphony. Stokowski, on the other hand, utilizes an almost Mahlerian set of forces, including two tubas, six horns, alto flute, and harp, the last of which plays only the final four chords and cannot be heard among the fortissimo din of the other instruments. So the largest-sized orchestra played the shortest piece. My soloist for this, and the next concert in Beijing, was pianist Angela Au. She has a most interesting background. At 11 years old, she went from Hong Kong to the States and began her studies at the Curtis School. Under the tutelage of Gary Graffman, she became one of his star pupils. She decided to branch out several years later, entering Harvard to study economics. These days she divides her time between two professions, one in music and the other in the business world. The concerto performed on this occasion was the second by Saint-Saëns. It is nice to see this work coming back into favor, as it is a marvel of construction and clarity. Angela brought a lyrical and expressive style to the Bach-like first movement. Good humor and lovely sound came to light in the scherzo, and the finale had the requisite power, encouraging the audience to request two encores. It was interesting to note that the public in Guangzhou is relatively young. The orchestra has made great strides in reaching a broader audience, and it is paying off with good attendance and a clearly well-informed set of listeners. All in all, this was a wonderful experience. Staying on the mainland, we headed to Beijing for what was my second appearance with the China Philharmonic. There are at least 13 orchestras in this capital city, and at least three full-time concert venues. As with the ensembles in Guangzhou and Shanghai, this one is under the music directorship of Long Yu. He conducts each orchestra, chooses the personnel, and guides the shape of each season. I was a bit surprised to see that there were eight rehearsals for just one performance. The program was identical to the one the previous week, but there were stark contrasts between the two orchestras. In Beijing, they have a kind-of old European standard for how the practice periods operate. The idea is that the conductor will basically teach every aspect of any given piece of music. So sight-reading is not their strong suit. It was up to me to take them through the pieces from square one. Remembering this from my past experience with the orchestra, I made sure to utilize as much of the time as possible, getting the orchestra to the point where, after the first couple of days, I could focus on the actual music-making rather than just the technical aspects of the score. This orchestra has a very different sound than its counterpart to the south, a bit thinner in tone and perhaps with less virtuosity. Nonetheless, they worked hard to get all the pieces learned. 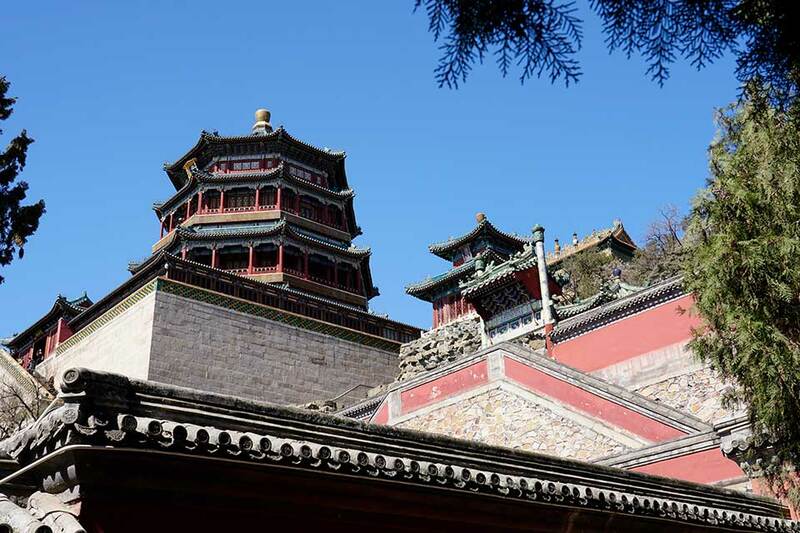 But with seven of the rehearsals taking place in an acoustically difficult facility, it was a bit of a shock to enter the concert hall in the Forbidden City. All of a sudden, the dryness of the studio was replaced with an overly reverberant sound onstage, making it tricky to establish the same tempi and dynamics that we had worked so hard on during the four prior days. Fortunately, I was told that in the audience, the sound was actually quite good despite these difficulties. The orchestra did work hard, and the end result was fine. A story was related to me that this ensemble can be a bit aggressive if they do not like the conductor. Apparently on one occasion, a guest got huffy with them, and one of the members of the string section hurled his bow at the podium. I kind of wanted to see that, but I took the non-combative stance on this occasion as a compliment. Cindy and I had some time to explore a few of the city’s sights this time. Surprisingly, there was little if no pollution for almost our entire stay. This was due to an annual two-week conference of politicians from all the provinces and cantons in the country. With the entire leadership of China in Beijing, the clouds had been seeded with some sort of chemical that produces rain. Factories were shut down as well, so clear skies abounded. 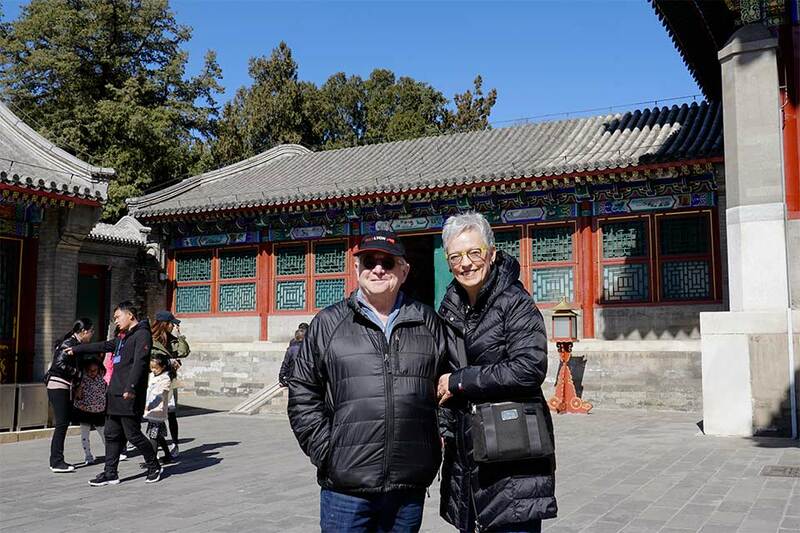 We took the opportunity to visit the Summer Palace, which emperors would use as a warm-weather retreat, and now presidents spend about two months in residence. The grounds were absolutely stunning, and even in March, filled with visitors. There were several tributes to the Empress Dowager. I think they should come up with a better term for that person. Michael Ma, the DSO’s associate principal bassoon, had given us a couple restaurant recommendations, which we gladly took to heart. As fine as the Beijing Duck was at the chain known as Da Dong, it was the garlic crab that really was the highlight for me. I would come back for the spindly creature anytime. The scheduling gods planned a circuitous route for this trip. Instead of staying in China, we had to first fly to Osaka where I would conduct a Japanese orchestra other than the NHK Symphony. 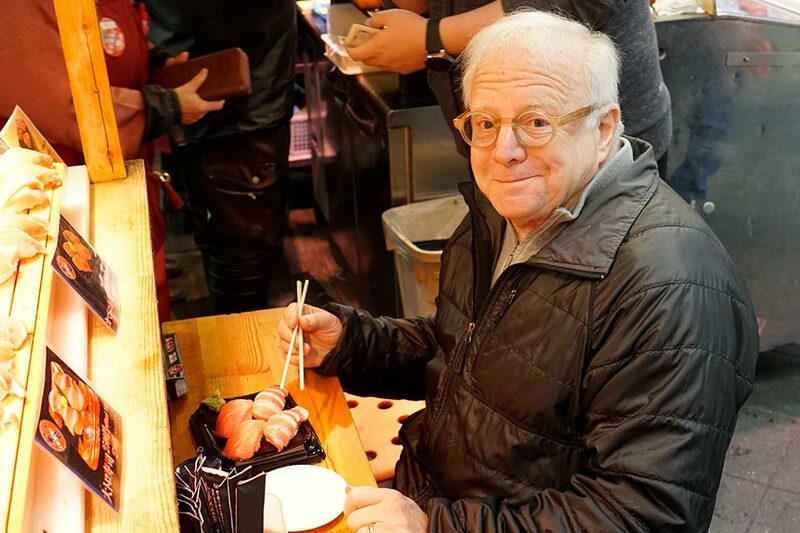 With 37 years of directing the Tokyo-based orchestra, it was somewhat surprising to realize that all the other cities where I have led concerts were destinations with American or European orchestras on tour. Cindy and I had a day off and went to visit various markets. 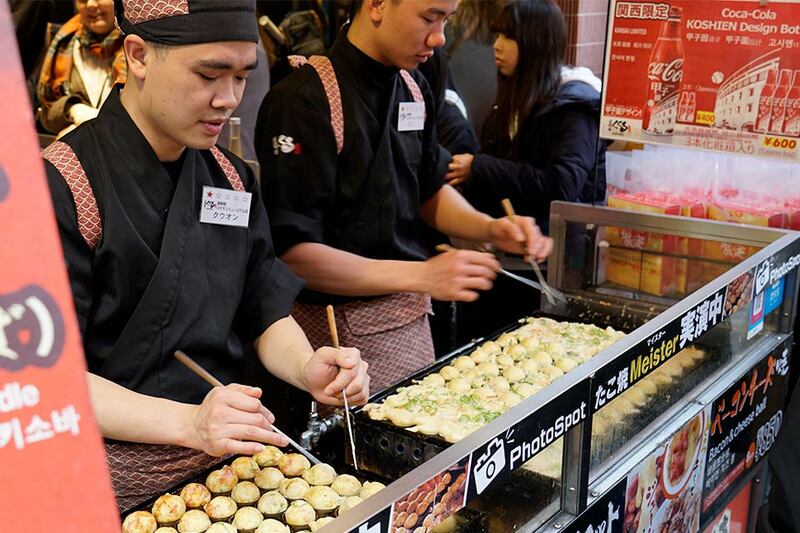 We had an opportunity to try a specialty of the region, takoyaki, dough-based snacks that encase little bits of octopus and look like doughnut holes. They are a bit more bland than I expected. In the meantime, I had to deal with an orchestra I did not know in a somewhat difficult program of music unfamiliar to this group. Copland’s Third Symphony, as well as the rest of the pieces, were directly requested from the orchestra’s management. Usually I don’t do this huge work with groups I have never conducted, but since this orchestra is considered one of the best in Japan, taking the chance seemed worth it. Reading through the work in the somewhat loud acoustics of their rehearsal space, I was a bit concerned. But when we started to really put the piece together, they were quick and responsive. The practice sessions are a bit different as far as time allotment goes. You work for three-and-a-half hours straight, with only a ten-minute break every hour. There is not much time to recover, with barely enough time to catch one’s breath. But we managed to get through the symphony and began putting the remaining pieces of the puzzle together. After the lengthy session, we were given an hour and a half to go get something to eat. Shinji found a small sushi bar nearby. Familiar fish were presented in novel ways, and each of the ten pieces was delicious. When my guide told the chef who I was and what I did, he wanted a photo to put on his wall. Then it was back to the rehearsal space to meet the chorus. Although amateur, they were outstanding. I had to give them a couple pronunciation exercises for the Hebrew in Bernstein’s Chichester Psalms, but they caught on quickly. Things were a little different on the second day. Because of the chorus, we started at 2:30 so the singers could join in for the final stretch in the early evening. The orchestra had clearly looked over all the music from the previous day, and our rehearsal time proceeded quite smoothly. The final day in the rehearsal studio was primarily useful for cleaning up passages that are tricky, but also playing through each piece so that we would not have to expend too much energy at the dress rehearsal. My reasoning was based on the fact that our only time in the concert hall was just a few hours from the start of the program, and with Copland Three, one does not want to overdo it with the brass. All went well, and I was confident that we would have an excellent performance. Osaka is a surprisingly expensive city, especially when it comes to the hotels. There are about 20 restaurants on the basement floor of the hotel where we stayed. Each one has prices that are triple that of what you might find in surrounding areas. Even so, those little octopus tidbits and four pieces of sushi that I had as street food cost over 75 dollars. We finally got to Festival Hall, a multi-purpose structure that seats almost 2,225 people. The acoustic is quite resonant, with the stage favoring the higher end of the audio spectrum. This dress rehearsal took place at 3:30 in the afternoon, only a few hours before the 7 p.m. curtain time. But the overall sound was good, and I was confident that the orchestra and chorus knew the material well. A mostly full house greeted me upon my entrance, and we proceeded to give them their money’s worth. The orchestra ripped through the Candide Overture with energy and humor. A Copland rarity, Down a Country Lane, was played with charming simplicity. The Chichester Psalms were truly excellent, and a tear or two came toward the end, when I remembered conducting this piece just days after Bernstein died. The soloist, Daichi Fujiki, is a counter-tenor. Daichi was excellent, with a beautiful, romantic voice. Even though he is an experienced artist, he projected the air of innocence required. I have always done this piece with a boy soprano but now find that this alternative works well too, expressing the words in a slightly different way. The orchestra gave every ounce of their concentration, and the performance was exciting. The audience was really enthusiastic, cheering upon the work’s conclusion. It is most satisfying to know that American music is really becoming part of the world’s musical culture in the concert hall. Even if unfamiliar, audiences, at least in Osaka, are willing to listen to pieces that are new for them. One tradition that is still part of the Japanese concert-going experience is the ritual of signing CDs, posters, programs and almost anything else that fans bring with them. I have been coming to Japan since 1982, and I have noticed that the lines get longer with each visit. There are a couple of people who show up to almost every performance I do in the country, sometimes traveling for a few hours to get to the concert. The same was true this time. However, when I looked out at the line, I could not see the one admirer who is always present. My concern was that something untoward had happened that might have prevented him from being with us. No worries, however, as his smiling countenance popped up with only four more people left in the queue. At the start of this week, there was a troubling matter that occurred. Instead of just including it as part of this piece, I wrote an article detailing what happened. Here is the story. When it comes to travel, Americans have had it relatively easy. Moving from country to country has presented few problems, and when the European Union was formed, crossing borders became even easier. Only a few locations on the planet were verboten. This March, I made my annual visit to Asia. Sometimes it is on tour with an orchestra, and other times it has been to conduct the orchestras of the Pacific Rim. During the course of this five-week trip, I would go to China, Japan and Hong Kong. One has always needed a visa for these locations, and this time was no exception. Prior to my departure, my assistant traveled to Chicago to present various documents that were needed to allow entry into China. However, my itinerary was complicated. The first two weeks were in Guangzhou and Beijing, respectively. My schedule took me next to Osaka and then back to China, with a visit to Shanghai after that. Chinese law requires that a new visa has to be issued, as once you leave the country as a member of the working class, you have to reapply. That meant obtaining a new visa at the Chinese offices in Japan. When I arrived at the Osaka visa office, there was the usual waiting around for my number to be called. After half an hour, I was ushered to a person, but we were separated by a glass partition. It looked like something out of a prison visiting area. After presenting my papers and passport, the woman said that I had to give them my previous passport, which had expired back in 2015. Of course, I carry that around all the time, just in case this comes up. No, it was sitting somewhere in my house in St. Louis. I asked why this was necessary. “But I did not have to do that when I received the initial visa for these past two weeks in China,” I responded. For the Japanese leg of the trip, I was accompanied by a representative from my Asian artist agency. He called the main office in Tokyo, and it was decided that we had to send the paperwork and passport to them. After that, these items would go to an expediting service that has dealt with Chinese visas many times. I began to suspect that there was more to this than just bureaucratic intervention. Two years ago, the Chinese government had tried to disallow the Korean members of the Detroit Symphony from entering the country during our Asian tour. The dilemma got solved, but the problem now seemed to be heading my way. Now I was without the most valuable possession one should always have on an out-of-country trip: my passport. It was headed north, and I was not sure how long it would take to process everything. One, two, three days passed, and there was no word as to when or if the Chinese were going to allow me to enter their country. This was made more annoying by the fact that I had just been there with no fuss made. On the second day, I had to reconstruct all my travels outside the States, sign a paper to that effect, and pass it on to the Chinese visa service in Tokyo. They determined that since I had traveled to Turkey and Morocco, there might be some connection to terrorism. I know that a baton can be construed as a weapon, but only the composers have been injured. With just three days to go before the planned departure, nothing was moving forward. There was a national holiday in Japan to celebrate the equinox. All government buildings were closed, and nothing was accomplished. The weekend was fast approaching, and I did not know where I would be headed come Monday. Everyone was working very hard on the situation, and I was grateful, but nobody yet knew how this would turn out. My own suspicions regarding the reasons for this situation were confirmed by my agency in Tokyo. I seemed to be caught in the economic and political crossfire between the two countries. If the stalling tactic was supposed to make me feel anxious, it had succeeded. My real concern had to do with being minus my passport. As far as I knew, it was sitting in the Chinese visa office, and no one could get it on my behalf. It was also becoming apparent that this new “law” had only gone into effect the past few days. No one could have anticipated that anything was changing. In the small world of classical music, I wondered if anyone else had yet been affected. I did not even know if the Shanghai Symphony had been contacted. Perhaps they could have helped in this situation. By Friday, the orchestra finally knew of the problem. They said they would try to help, but then offered an alternative as to my schedule. If the documents were not ready later in the day and the visa was not issued until Monday, we could begin rehearsals on Wednesday, and the Shanghai Symphony would do individual sectional rehearsals on their own the day before. That meant that I would have one less day of practice. Flights would have to be changed, a hotel would need to be secured for the Monday evening in Osaka, and I had to rethink my own rehearsal plan. Not a particularly great solution. A day trip to Kyoto might be in the offing as a bit of solace during this storm. The saga came to a successful conclusion late on Friday afternoon, when the office finally issued the visa. My agent in Tokyo obtained the document at 5 p.m., and even sent a photo for me to peruse. She would come to Osaka on Saturday with my passport in hand. Still, the stress of not knowing had caused some mental and emotional strain during these five days. What should have been a simple matter wound up involving people in three countries. All those who worked tirelessly, my managements in Asia and the States as well as the Shanghai Symphony, need to be commended for their diligence and persistence. Hopefully, my experience will not be that of other American musicians and professionals who are going to China. But let this serve as a warning. Travel these days is extremely complicated. Take every precaution necessary to ensure a smooth transition from one place to the other. Make sure that everything is in order so that there can be no questions as to your readiness to enter the country. However, as I learned, roadblocks can be put in the way at the last moment. It is frustrating and annoying, but more than likely, in the end, you will get where you are supposed to be. I now look forward to a wonderful musical week with the orchestra and the pleasures of a great city. And indeed, it was a fantastic five days of music-making in Shanghai. How interesting to play the same piece with the three Chinese orchestras on this trip. With more and more musicians from the Western cultural heritage coming to Shanghai, for teaching and playing, this orchestra most closely resembles what one would find in the States. They came to the first rehearsal prepared and did not expect me to teach just the notes. The Shanghai Symphony is also the orchestra that probably has the most stars in the principal chairs. Many of these musicians have studied in Europe or in the United States. American orchestras and conservatories, in particular, have established working relationships with Shanghai. It is easy to see the future when you think about how far China has come in such a short time. One big plus for the orchestra is that it rehearses in the same hall where concerts are performed. This has the benefit of giving structure and cohesiveness to the balance and sound. The relatively new building is a bit resonant at rehearsals, but after a day, everyone adjusts to the acoustic, and it becomes very clear as to how making music will be for the rest of the week. Rachmaninov 2 had a nice warmth to the sound but, as seemed to be the case with all the venues on this trip, could have used just a bit more in the lower end of the sonic spectrum, at least to my taste. This was just the way the hall is. Intonation was solid, so we could focus on phrasing and balance. By the time we got to the dress rehearsal, all I had to do was highlight a few passages, just to be safe. Once the audience was in place, everything had a much more natural feel, and the performance was outstanding, with everyone giving their all throughout the hour-long journey. Our soloist was Noah Bendix-Balgley, whom I last worked with when he was concertmaster of the Pittsburgh Symphony. A couple years ago, he took on the same position, as one of three, in the Berlin Philharmonic. 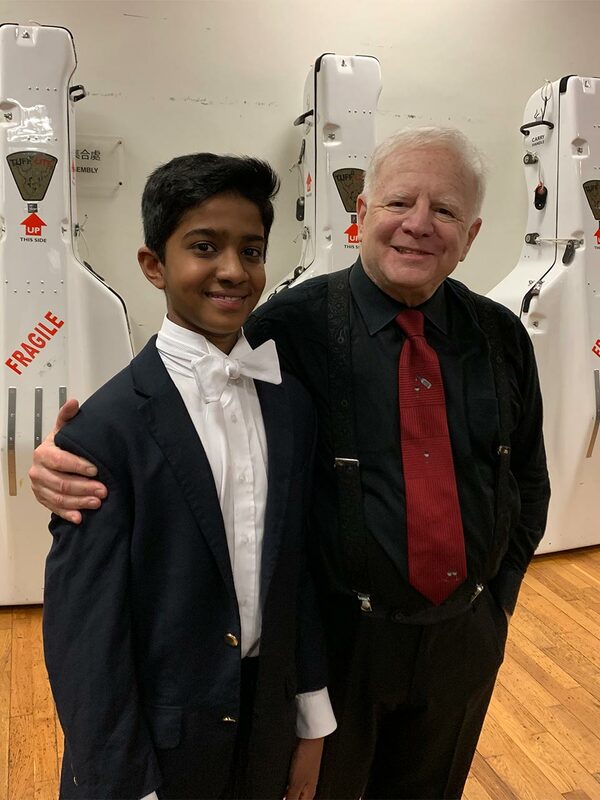 This gives him the opportunity to pursue a solo career as well as participate in chamber music and teaching all over the world. With the Second Prokofiev Concerto on the agenda, I expected that this would be a fine experience, and it was. One of the amazing things about China these days, at least as far as classical music goes, is that the audiences are uniformly younger than anywhere else in the world. There is a level of sophistication that this generation brings to the concert hall. Courteous and attentive, they now let loose at the end of performances, giving prolonged ovations. These feel natural, a result of an appreciation of the level of musicianship on display. The three weeks spent in this country showed why they are fast becoming the world leaders in economics and an enormous marketplace for Western cultural understanding. And then it was off to Hong Kong. Surprisingly, I had only conducted in this island metropolis as a visitor with touring orchestras. This was my debut with the house band, the Hong Kong Philharmonic. Now celebrating 40 years of existence, the orchestra is truly excellent. Jaap van Zweden has created a strong ensemble, with secure and expressive playing in every section. Rehearsals were efficient and highly charged with energy. And the same can be said of this entire region. Our hotel was near the Cultural Center, on the Kowloon side of the bay. We were fortunate to have a room overlooking Hong Kong Island, where one can see the dramatic skyline while watching ferries, cruise ships and junk boats doing their best to avoid running into each other. The waterway provides a glimpse into the pulse of the city, what one might call Manhattan on steroids. The second you step outside, the hustle and bustle of the place takes over and sweeps you into a maelstrom of activity. 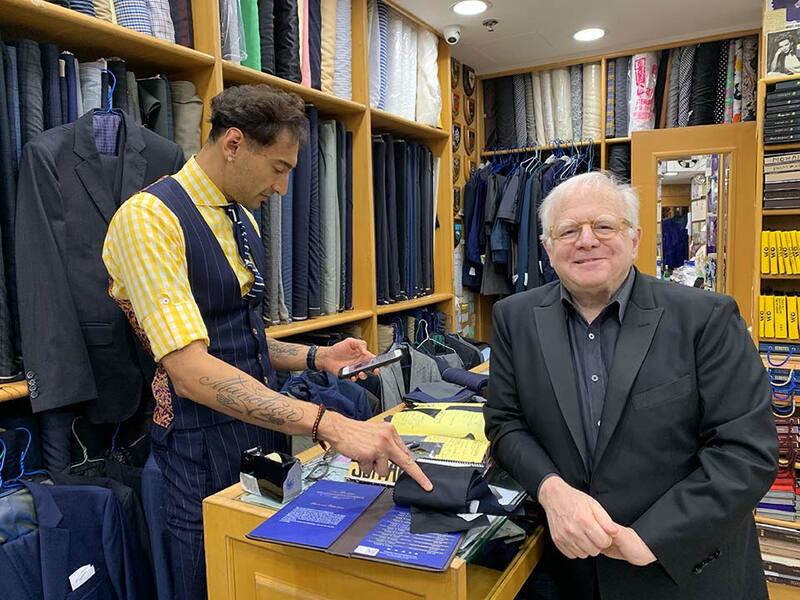 The first stop was to one of the great tourist destinations: Sam’s Tailor Shop. The first time I visited this metropolis, I was directed to the Burlington Arcade, named after a high-end shopping mall in London. This one is on the busy Nathan Road, and it is there that hawkers are plying their wares, and in particular, wanting to make a suit for you. For longer than I have been conducting, Sam’s has entertained a clientele that ranges from presidents and potentates to actors and sports stars, many of whose photos adorn the dressing room areas. It is a virtual who’s who of celebrity leaders throughout the world. The last time I was here, six years ago, I had a couple suits made as well as a tuxedo and some shirts. They have held up well, but it was time to get refitted. By the time Roshan had sweet- talked his way into having me purchase twice as much as before, I knew that my days of clothes shopping were coming to an end. The small shop was very busy, with regulars and newbies coming to enhance their wardrobes. Cindy even got into the frenzy and had a couple jackets made. Another feature of Hong Kong is its amazing culinary variety. Cantonese is the cuisine of choice, but there is not a food type you cannot find here. Okay, maybe not a deli-style corned beef sandwich, but everything else is fair game. Even the street food has mouthwatering delicacies on offer. And you could spend your life savings buying a luxury European car, although it would have to be suitable for driving on the left side of the road. 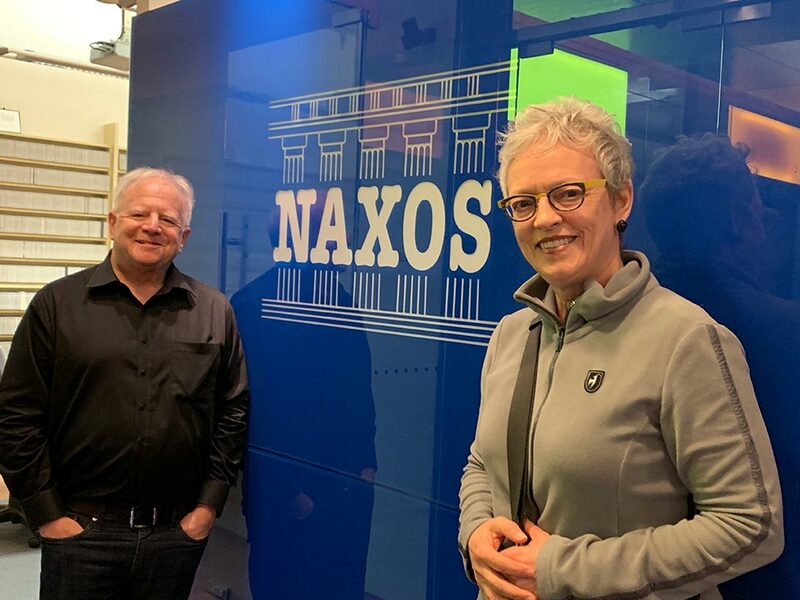 Hong Kong is also the home of Naxos Records. In addition to hosting us for a lovely dinner, the staff presented me with an early birthday present. Since I started recording with the company 15 years ago, we have produced 45 albums together. These were put together in a beautiful boxed edition, and I was very touched by this gesture. And we still have more to come. Can’t wait for my 100th. The orchestra reflects the high energy level provided by the city. It took a little while, but eventually they calmed down and produced beautiful lyric sounds when required. Chichester Psalms was an entirely different ball game from the Osaka version. This time, the choir, from the Eton Chapel in England, consisted almost entirely of men and boys. Bernstein had said that this is the way he envisioned the piece being performed, but it was a first for me. We also had boy-soprano Sanuda Kariyawasam as soloist, but a counter-tenor was on hand in case the adolescent had a sudden change of voice. I revisited an old musical friend, Chris Rouse’s Infernal Machine. This piece from the Eighties retains its shock value, and at five minutes, puts the proverbial kitchen sink into the sonic hijinks. Barber’s Adagio followed, then the Bernstein. Tchaikovsky’s Fifth gave us all a chance to judge each other, and the orchestra was hair-trigger sharp in getting the nuances I was looking for. They also brought their individuality to this staple of the repertoire. Wonderful solo winds and excellent ensemble work from everyone. All in all, this five-week Asian extravaganza was a memorable experience. I learned a great deal and enjoyed way too much food. Next season, it is back to this part of the world with engagements in Tokyo and Seoul. Now it is time to get back to the States.